Battery problems? Have you tried charging it with a Motorcycle Battery Charger? ~How do I charge a motorcycle battery? ~Do I have to charge a motorcycle battery? ~Can I put my battery straight on the bike to charge it? ~Can I use a car charger, general automotive charger or a high rate charger? ~My motorcycle battery has gone flat, can I recharge it? ~Can I charge the battery by starting the bike once a month and letting it tick over? ~I've filled my sealed battery (YTX, CTX, DTX etc) and the acid doesn't cover the lead plates? ~When I put the battery on the bike, which terminal do I connect first? ~What will happen if I connect the battery terminals the wrong way round? ~How tight should the battery terminal bolts be? ~I have just connected the battery terminals the wrong way round? 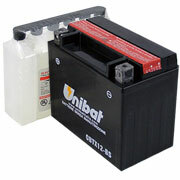 ~Why do I need to top up my lead acid battery? ~I need to top up my old battery, what should I use? ~Do I need to top up my Maintenance Free (code YTX) or Gel filled (code YT or YTZ) battery? ~My battery says CTX9-BS on it, is this the same as a YTX9-BS? ~Can I upgrade my conventional (YB/CB/CB) or sealed (YTX/CTX/GTX) battery for a gel battery? ~I don't know which battery I need, but I know the size and/or specifications? ~I have a Chinese bike and the battery has an obscure part number on it, which battery do I need? ~What kind of motorcycle battery do I have (lead acid, sealed or gel)? ~How can I check if a motorcycle battery is fully charged? ~How long does a motorcycle battery last for and why don't they come with long warranties like car batteries? ~What happens if I charge the motorcycle battery with the terminals connected the wrong way? ~What is the white stuff that collects in old batteries? ~How do I keep my motorcycle battery from sulphating? ~Is it true that you shouldn't leave a motorcycle battery on a concrete floor because it loses it's charge quicker? ~If I disconnect the battery terminals, will the battery still go flat? ~Why are some batteries bigger than others? ~I've taken the top off my sealed battery (YTX, CTX, DTX etc) and can't see any acid in it? ~What is battery acid and is it corrosive? ~Can I bump start my fuel injected bike with a completely flat battery or no battery? ~I have accidentally drunk some battery acid I left in a lemonade bottle? ~I've put a new battery on my bike but every time I go to use it the batteries flat? ~My bike won't start (flat battery), but when I go to start it what is the clicking noise? ~I have a Chinese made bike or scooter that keeps flattening the battery? ~I have a battery question but I can't see it on this page? Do I have to charge a motorcycle battery? Can I put my battery straight on the bike to charge it? Unfortunately, this method of charging a battery will also mean the battery is only ever 80% efficient and may damage a new battery. Although many people suggest charging the battery this way, charging the battery on the bike will greatly shorten the life of the battery and can cause wear or damage the lead plates inside the battery. New batteries should be charged with a motorcycle battery charger (not a car or general automotive charger) before they are used. Can I use a car charger or a high rate charger? NOOOOOOOOOOO!!!!!!! A car or high rate charger will force a higher rate of charge into the battery, which can result in permanent damage to a motorcycle battery. Because of their size, motorcycle batteries cannot take the same high charges or abuse that car batteries can so a specially designed a Motorcycle Battery Charger must be used. My motorcycle battery has gone flat, can I recharge it? Yes, you can recharge a flat motorcycle battery as long as the battery isn't damaged and is accepting a charge, but, once the battery has gone flat a few times, this is often the beginning of the end of the batteries life. You would normally need to recharge a flat battery at least overnight, or longer if the battery voltage is very low. As long as the lead plates in the battery aren't damaged, they can often be recovered with a charger specially designed to recover deeply discharged batteries like the Oxford Oximiser motorcycle battery chargers. Can I charge the battery by starting the bike once a month and letting it tick over? Motorbikes are meant to be used (not sat in a shed for months on end!). The best way to maintain a healthy battery is to use the bike regularly. It is NOT advisable to try and maintain your battery by starting the bike up once a month and letting it tick over for 5-10 mins. This method actually uses more power to start the bike than the charging system will put back in at tickover and will, over time, flatten the battery. When a bike is ticking over, the charging system is normally only putting a minimum voltage level (around 12 to 12.5 volts) through the system. This isn't enough to charge a motorbike battery. As the rev's increase (e.g. when the bike is being ridden), the voltage level being put back into the motorcycle battery increases to around 13.5 to 14.5 volts and it's the extra power being produced when the bike is being ridden that charges the battery. A discharged battery can sometimes be brought back to life by taking the bike out for a long run and really using the gears and the rev range. I've filled my sealed battery (YTX, CTX, DTX etc) and the acid doesn't cover the lead plates? I've taken the top off my sealed battery (YTX, CTX, DTX etc) and can't see any acid in it? Maintenance free or sealed type batteries (which normally start with the code YTX, CTX or DTX, e.g. YTX9-BS) are known as 'dry cell' batteries (as opposed to older, conventional style batteries which are known as 'flooded cell' batteries). The lead plates in maintenance free batteries absorb the battery acid/electrolyte so the acid doesn't have to initially cover the plates and won't be visible if the cap is removed from the battery. If you remove the cap and you can see battery acid, this can mean the battery may have been overfilled (there's too much acid for the lead plates to absorb) or it can be an indication of a poor quality battery as cheaper batteries made from cheaper plate material don't absorb all the acid. Please remember: If you remove the cap and don't see any electrolyte in the sealed type battery, this is completely normal so don't top the battery up with more acid as this can cause the battery to leak or fail! When I put the battery on the bike, which terminal do I connect first? There's no 100% right or wrong way to connect the terminals, but it is advisable to always connect the positive (+) or red terminal first. Make sure there are no flammable substances (i.e leaking petrol!) around the bike as connecting the battery can produce sparks which can ignite flammable materials. What will happen if I connect the battery terminals the wrong way round? Your local dealer will be laughing all the way to the bank with the money they made from all the spare parts you had to buy! You might be lucky and just blow a fuse. We, however, work on the sods law theory (if it can go wrong, it will go wrong!) which usually means replacing lots of expensive electrical parts like the CDI. I have just connected the battery terminals the wrong way round? 1) Call White Dog Motorcycle Accessories and get ready to part with vast amounts of money! How tight should the battery terminal bolts be? Use a screwdriver or spanner to make sure that the bolts are as tight as they can possibly be. A common problem that occurs with bikes (even brand new ones!) is that the battery terminal bolts are not tight enough (basically, when you think you've tightened the bolts up enough, tighten them a bit more to make sure!). Battery terminal bolts that are not attached securely will work loose and cause erratic and rough running problems as well as starting problems. Why do I need to top up my lead acid battery? I need to top up my old battery, what should I use? Top up old lead acid batteries with distilled water. The electrolyte (or battery acid) is a mixture of water and sulphuric acid. When the battery reacts to produce electricity, only the water part of the mixture is used up so adding distilled water dilutes the electrolyte mix back to its correct strength. Make sure you use distilled water to top up your battery. Tap, bottled and other waters contain impurities (not normally visible to the naked eye) which can damage the lead plates and other parts in a motorcycle battery. Don't use battery electrolyte (or battery acid) to top the battery up as this will make the acid in the battery too strong. If the acid in the battery is too strong it will eat into and damage the lead plates and other components in the battery. Battery acid (or electrolyte) should Only be used to initially fill the motorcycle battery. Do I need to top up my Maintenance Free (code YTX) or Gel filled (code YT or YTZ) battery? No, Gel batteries and Maintenance Free batteries (also known as sealed batteries) do not need topping up or need to have the acid levels monitored. Gel acid batteries (which usually start with the code YT, CT, GT or YTZ, CTZ, GTZ) are filled when they are made and are sealed at the factory so they don't need topping up with acid at a later date. Maintenance free or sealed type batteries (which usually start with the code YTX, CTX or GTX) come with the acid separately and are filled when they are sold. Once the cap is put in the top, the battery is then 'sealed for life' and the cap doesn't have to be removed and the acid level checked. My battery says CTX9-BS on it, is this the same as a YTX9-BS? In most cases, yes, the batteries are the same. The first letter is a manufactures mark and different makes of batteries use a different letter. For example a Sprint battery would be YTX9-BS, an Exide battery would be CTX9-BS and a Delco battery would be GTX9-BS. This applies to most models of lead acid, sealed and gel filled motorcycle batteries. A couple of exceptions to the rule are Westco and Yuasa batteries, who seem to make up their own battery listings, more to make life difficult and to p*ss people off then for any practical purpose! If in doubt, we can usually confirm a battery if you send us the dimensions or the make, model and year of motorbike a battery is from. Can I upgrade my conventional (YB) or sealed (YTX) battery for a gel battery? You probably can, but.........IF YOU VALUE YOUR SANITY, DON'T DO IT!!!!!!!!!!!!!!! We don't recommend 'upgrading' or replacing your original lead acid (starts YB, CB or GB) or maintenance free (starts YTX, CTX or GTX) battery with a gel battery (starts YT, CT or GT). Gel batteries can be temperamental at the best of times and most of the 'gel replacement' batteries that are currently available have a very high failure rate (which is the main reason we don't sell them!). Gel filled batteries (unlike conventional and sealed type batteries) are filled with gel acid and sealed when they are made so the battery discharging process starts earlier in the gel batteries. Sealed type and conventional motorcycle batteries are normally only filled when they are sold so they have a much longer shelf life than there gel filled counterparts. Alot does depend on how long the manufacturer, importer or shop has had the battery sitting on their shelf before it is sold, the longer a gel battery has sat on a shelf somewhere, the more it has degraded and the greater the chance it will fail fairly shortly after use. Please bear in mind, this is based on our experience's of gel motorcycle batteries, we are certain someone who sells them will tell you that gel replacement batteries are the best thing since flavored condoms!!!! Update: Despite people assuming that upgrading to a gel battery will be the end of all the battery related problems as we know it, many of the major and OEM battery manufacturers (including Yuasa, Unibat and Varta) are now developing and releasing maintenance free replacements for gel filled batteries due to reliability problems with gel filled batteries!!! I don't know which battery I need, but I know the size and/or specifications? I have a Chinese bike and the battery has an obscure part number on it, which battery do I need? Alot of the Chinese bikes and scooters have very obscure batteries that aren't readily available in the UK. They also have the added problem that although they may have the same part number as a battery we supply, the dimensions and output of the Chinese bike battery may be completely different! The best way to find the battery is to measure the old battery currently in the bike and use our Select Battery by Size or Spec Page to try and find a replacement battery. Please note- Fitting a battery to a Chinese bike or scooter may mean you will have to modify your bike to fit the battery into it or modify the battery terminal leads! What type of motorcycle battery do I have (lead acid, sealed or gel)? For most motorcycles there are 3 kinds of motorcycle batteries, Lead Acid batteries (also known as conventional or flooded cell batteries), Sealed batteries (also known as AGM, maintenance free and dry cell batteries) and Gel Filled batteries (also known as gel and gel acid batteries). There are also lithium motorcycle batteries, although these are not normally used in road bikes (mainly race bikes) as they don't like extreme temperatures (especially the cold!). Lead Acid Batteries - These batteries are an older style battery and can also be called flooded cell and conventional batteries. They normally have an opaque lower casing (that you can see the acid level through), a black cap and a row of stoppers in the top (3 stoppers for 6 volt batteries and 6 stoppers for 12 volt batteries). 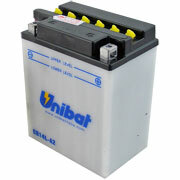 12 Volt lead acid batteries normally start with the battery code YB, CB, DB, GB or 12N (e.g. YB14L-A2 or 12N24-3). 6 Volt lead acid batteries usually start with the code 6N or B (e.g. 6N4-2A or B39-6). Sealed Batteries - These batteries can also be called maintenance free batteries and dry cell batteries and are normally only available as 12 volt batteries. Maintenance free batteries normally come with the acid separately and usually have a black, blue or grey outer case and have a stopper sunk into the top. Once filled, these batteries (which are Hermetically sealed and not refillable) DO NOT need to have the top removed or the acid level checked. Sealed / maintenance free batteries usually start with the battery code YTX, CTX, DTX or GTX (e.g. YTX9-BS and CTX9-BS etc). Gel Batteries - These batteries can also be called gel acid or gel filled batteries and are normally only available as 12 volt batteries. Gel batteries usually have a black, blue or grey outer casing and top and don't come with any separate acid and don't have any stoppers in the top (mainly because the are factory filled with a gel state acid when they are made). Gel filled batteries are often used on bikes (like the early Yamaha YZF-R1) where the battery has to lay on it's side or at an angle. Gel battery numbers usually start with the code YT, CT, DT or GT (e.g. CT12B-4) or YTZ, CTZ, DTZ and GTZ (e.g. YTZ12-S). How can I check if a motorcycle battery is fully charged? How long does a motorcycle battery last for and why don't they come with long warranties like car batteries? Most motorcycle batteries are at their best for about 3 years. Because of their size, motorbike batteries don't last anyway near as long as car batteries so warranties tend to be alot shorter. -Long periods of inactivity (e.g. Summer only riders and only riding 100 miles a year). -Alarms, incorrectly wired heated grips and other electric gizmo's on the bike. -Bikes that are only ever used for short journeys (less than 10 miles). -Batteries being repeatedly run flat. You can only usually run a battery flat then charge it up again 2 or 3 times before it will be unserviceable. -Fault charging systems and/or loose or degraded wires on the bike. The chances of a motorcycle battery lasting longer can be greatly increased by using a smart battery charger, but, this is still no substitute for actually getting out and using the bike! What happens if I charge the motorcycle battery with the terminals connected the wrong way? Most motorcycle battery chargers over £25 have the ability to sense if the motorcycle battery terminals have been connected the wrong way round, and if they detect this has happened, they won't pass the incorrect charge into the battery. But, cheaper and older motorcycle battery chargers that don't have this function, won't switch off if you connect the terminals the wrong way to the battery. Normally, this will 'cook' the internals of the charger (making it useless, this is normally accompanied by the smell of knackered electrics!) or it can damage the battery and 'short out' the connections inside the battery (which again, can make the battery useless). It is always advisable to disconnect the battery from the motorbike or scooter before charging, because if the battery is connected to the bike when the charger is connected the wrong way round, this can blow fuses (if your lucky!) or other electrical parts (like the CDI and reg/rec) on the bike. What is the white stuff that collects in old batteries? The white stuff is lead sulphate which is the same compound the lead plates in the battery turn into when they discharge. Lead sulphate is a crystal and can destroy a battery if allowed to build up. This process is called sulphation. In normal battery operation, lead sulphate never has much chance to build up on the plates because the charge cycle returns the sulphur back into the electrolyte and turns the plates back into lead. But a battery that discharges too deeply can develop sulphation. Another cause of sulphation is low fluid or electrolyte level in the battery. When the fluid level drops, the lead plates are exposed to air. Under these conditions, the lead plates will oxidize and sulphate and the battery will no longer hold a charge. How do I keep my motorcycle battery from sulphating? Make sure your motorcycle's electrical and charging systems are functioning properly so that any charge lost during starting or by the running of lights or accessories is replaced. Keep the battery terminals clean and disconnect them if possible when the motorcycle is in storage. Most importantly, charge the battery with a motorcycle battery charger regularly if the motorbike isn't being used regularly to maintain a healthy charge in the battery. Is it true that you shouldn't leave a motorcycle battery on a concrete floor because it loses it's charge quicker? You'll really believe anything you read, won't you? I suppose you still believe in Farther Christmas and the Tooth Fairy as well!? It doesn't matter what kind of surface you store a battery on, concrete, metal or wood as long as the battery is kept level, not stored in excessively high temperatures and charged regularly. If I disconnect the battery terminals, will the battery still go flat? A battery will still carry on discharging (going flat), even if it's not connected to a motorcycle although it will lose it's charge at a much slower rate. Why are some batteries bigger than others? The size and number of lead plates in a cell depends on the output of the battery. The more plates in a cell, the bigger the battery and the more current it produces and capacity (amp/hours) it has. What is battery acid and is it corrosive? Battery acid (or electrolyte) is a mixture of sulphuric acid and distilled water and is highly corrosive, please handle with extreme care. Try to avoid contact with skin and eyes and don't put left over acid in empty lemonade bottles! Can I bump start my fuel injected bike with a completely flat battery or no battery? Probably not if there's no battery or the battery is totally flat. The fuel injector system normally needs some battery power to prime the fuel system to get the fuel into the engine so it can start. I have accidentally drunk some battery acid I left in a lemonade bottle? I've put a new battery on my bike but every time I go to use it the batteries flat? - Faulty alarm systems can flatten a battery in a very short space of time as can motorbikes left for long periods with an alarm armed. - A faulty regulator/rectifier (or reg/rec) can flatten a battery. The reg/rec regulates the direction of the electrical charge and how much charge is produced from the engine, they do tend to fail occasionally and will flatten a battery if not working properly. A simple test to check if the reg/rec is working properly is to rev the motorbike or scooter with the headlight on, if it's working properly, the light will get brighter as the revs increase, if the light gets dimmer as you rev the engine, the reg/rec is probably faulty and may need replacing. - A common and often overlooked problem is loose battery terminals which can cause running and starting problems. Check the battery terminal bolts are as tight a possible and recheck them occasionally to ensure they haven't worked loose. My bike won't start (flat battery), but when I go to start it what is the clicking noise? The clicking noise that can be heard when the bikes starter button is pressed is the starter motor solenoid (also known as a starter relay) trying to turn the engine over but failing because there isn't enough power in the battery to turn the starter motor and engine over and start the bike. The starter solenoid is a relay (which can usually be found by following the red, positive lead from the battery) that activates the starter motor when the start button is depressed. The clicking noise occurs because there is enough power in the battery to activate the starter solenoid, but not enough to activate the starter motor or turn the engine over. I have a Chinese made bike or scooter that keeps flattening the battery? This is a common problem with Chinese motorbikes and scooters. Because the charging system used in these bikes often isn't up to the job, the bike relies too heavily on the battery and this leads to the battery being repeatedly drained of all it's power. The only solution we have found is to replace the battery for a bigger, more powerful battery that should be able to cope. 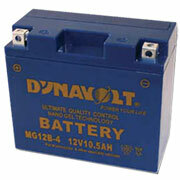 We normally recommend upgrading to a battery that is 2 to 3 amp/hour higher than the battery currently in the bike (e.g. using a YTX7A-BS battery to replace a YTX4L-BS). Please note- Fitting a bigger battery may mean you will have to modify your bike to fit the battery into it. Also, Chinese bikes are NOT an exact science!!! We have found upgrading the battery does help, but this may not work on all bikes! If there's a FAQ you would like to add here, use the Contact Us page to let us know!